탱화란 천이나 종이에 불화를 그려 족자나 액자형태로 만들어 거는 그림으로, 대개 사찰 전각 안의 본존불 뒤에 위치한다. 이 작품은 특이하게 나무를 깎아 만든 것으로, 관음전의 주존인 관음보살상 뒷편에 부조로 새겨져 있으며, 가로 184㎝, 세로 165㎝이다. 사각형의 판목 중앙에 아미타불을 중심으로 좌우에 네 보살이 배치되었고 그 주위로 2대 제자인 아난·가섭과 사천왕을 배열한 구도이다. 하단의 연꽃 줄기에서 나온 연꽃이 대좌를 이루어 본존불과 두 보살이 앉아있는 모습이다. 본존불은 두 손을 무릎에 올려놓고 엄지와 중지를 맞댄 손모양을 하고 있고 협시보살들은 손에 연꽃가지를 잡거나 합장한 모습이다. 불상들의 얼굴과 신체 등이 모두 네모난 형태로 비사실적 인체 표현이 드러나 있으며 이와 함께 두꺼운 옷에 간략화된 주름은 당대의 불상양식을 보여주고 있다. 이 목각후불탱은 목각탱을 회화적으로 표현한 17세기 작품을 대표하는 수준작으로 뛰어난 목조기술을 보여주고 있다. In a Buddhist sanctum, the wall behind the principal Buddha statue is usually adorned with a scroll or a frame of a Buddhist painting drawn on cloth or paper. 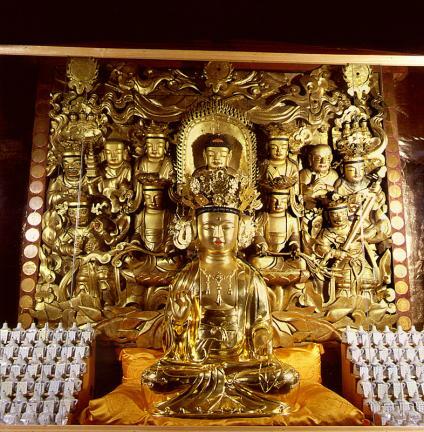 In Gwaneumseonwon Hermitage, however, there is a wooden relief sculpture on the wall behind Avalokitesvara Bodhisattva as the principal statue of Gwaneumjeon Hall. This altarpiece measures 184 cm wide and 165 cm long. 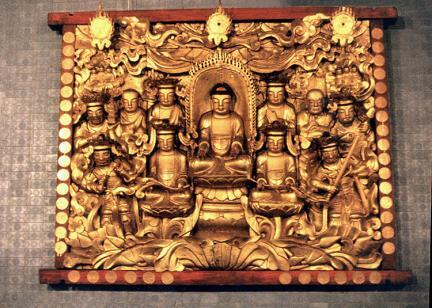 In this square frame, four Bodhisattvas are placed on both sides of Amitabha Buddha at the center, and his disciples named Ananda and Kashyapa and Four Guardian Kings are placed around it. Lotus flowers from the trunk of the bottom part form pedestals, with the Amitabha and two Bodhisattvas sitting on them. Amitabha puts his hands on his knees, his thumb and middle finger touching. The attendant Bodhisattvas are holding a spray of lotus flower or clasping their hands. The figures in this altarpiece have square face and body, and the simple folds of thick clothing show the typical style of Buddhist statues made in the 17th century.